Bye, B58. A stroked 2ZJ is now under the hood and making 800 horsepower. 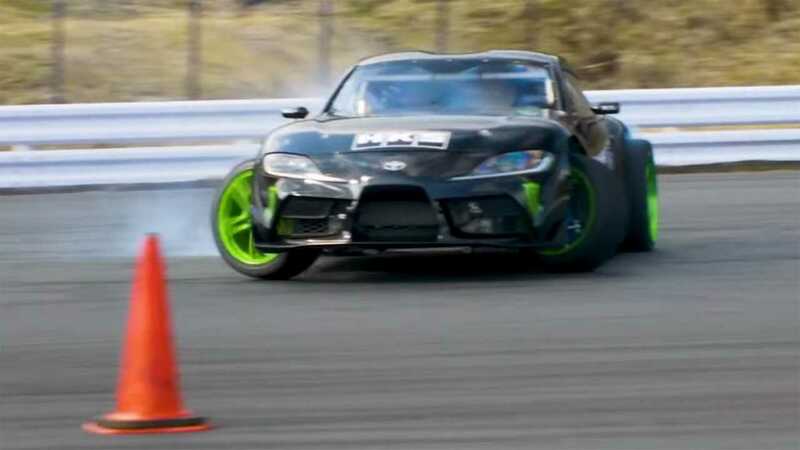 Professional drifter Daigo Saito recently showed off his 2JZ-inline-six-powered modern A90 Toyota Supra on Instagram, but a new video from Monster Energy has provided a lot more details about this sliding machine. There's even a shot to see it burning rubber into thick clouds of white smoke. Saito's team started with camouflaged Supra that looked like one of the many test mules we saw on the road for months during the coupe's development. The technicians then stripped the car down and ripped out the engine. Instead of the road-going model's BMW-sourced B58 inline-six, the classic 2JZ went in its place. Instead of the stock 3.0-liter displacement, the engine now displaces 3.4 liters. It attaches to a giant HKS turbo. The result is 800 horsepower (597 kilowatts) and 651 pound-feet (883 newton-meters) going to the rear wheels. A sequential transmission makes the job easier of banging through the gears. The video highlights Saito doing some testing before the team applies Monster Energy livery. He has absolutely no problem kicking the tail out. The engine sounds great, too. There's a raspy sound at idle that changes to a more muscular sound at higher revs, in addition to the persistent whistle and flutter from the turbo. Saito and his Supra will compete in the Formula Drift series. This year's championship will begin in Long Beach, California, on April 5. In addition to Saito's drift machine, it'll be hard to watch motorsports and not see a Supra soon. There will possibly be a version for GT4-class competition. There will also be a variant for Japan's Super GT series. Plus, NASCAR's Xfinity series already has a rather awkward-looking example on the track.